Where do you find the books you want to read? There are theories galore about how authors and publishers should advertise, use categories, keywords etc. But I often find myself a bit bemused by them. Because I don’t buy books that way. These theories seem to describe a behaviour that I simply don’t recognise. But I do buy books. All the time. So where am I discovering them? I don’t expect this post will set the world of book marketing alight. But I hope to illuminate some less acknowledged processes. And I’m curious to know what you do, so I hope you’ll join in at the end. I’ve never bought a book that I’ve seen on a Facebook advert. Yes, I know that advertising is there to remind you a book exists, not necessarily to grab your £££ immediately. I know that adverts have to be seen a certain number of times before they get noticed. And that they work in conjunction with other forms of exposure. I’ve certainly bought books by people I know on Facebook, but not because of adverts. I’ve bought because of meaningful contact – chatting to them, or an interview. More on that later. BookBub et al. I know these are smart sales tools, but they’ve always seemed rather superfluous to me as a reader. First, I don’t buy books because they’re bargains. I don’t find a book more appealing because it’s on special offer. I want the right book. Second, these newsletters are selling ebooks, and I’m one of those throwbacks who likes a solid version. To have, to hold and to keep. To remind me, by its bulk on the shelf, to give it attention. But I do use Kindle samples to check books out, so it wouldn’t be totally useless to me. Still, they are popular and effective for authors, so I thought I’d better evaluate them properly. What gems might I find by subscribing as a reader? An excellent article by the Alliance of Independent Authors compared them in terms of value for advertisers, and rated BookBub, Fussy Librarian and Bargain Booksy top. Fussy Librarian got a special mention because it wasn’t just promoting bargains. I subscribed to Fussy Librarian as a reader, asking for news of literary fiction. After two months of emails, I can report they – or the authors who advertise with them – are not remotely fussy about what they categorise as literary fiction. And this is a problem when you shop in this category. It’s easy for us all to agree what’s meant by categories such as crime, thriller, romance, paranormal or YA. But literary? The term gets put on everything that might not fit in the other boxes (and so, in Fussyland, it seems to mean cross-genre or two timelines). Here’s a post where I attempt my own definition of literary, in case you haven’t had enough. Meanwhile, several writers I know avoid the term altogether because they’ve learned their readers are put off by it. But Fussy Librarian isn’t everything. I decided to try BookBub, the grandaddy of book email lists. And here’s where I was surprised. I have seen a few titles that I’m keen to know more about, so it will be interesting to see if my buying habits change as a result of BookBub. So how do I discover books? 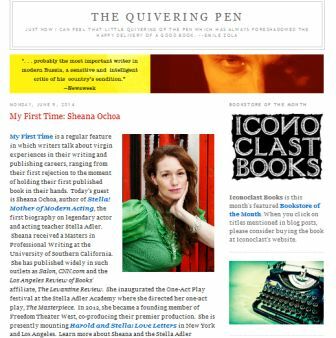 Blogs – the Literary Hub and David Abrams’s blog The Quivering Pen, which has interviews and a regular feature of upcoming titles. If you have a blog that showcases upcoming titles that correspond to my idea of literary, do let me know. Amazon’s ‘people who bought this bought that’ algorithm. I could wander in there for hours. Oxfam bookshops – a great way to find books everyone else has forgotten about. Especially non-fiction. Yes, I know that’s dodgy because the author doesn’t get a royalty. But often these are books that aren’t available anywhere else or I’d never have known to search for them. For research, I use Library Thing – this is the only time I search for books by categories, tags and all that labelling, because I’m shopping for something specific. But my pleasure reading is all surprise finds. This has to be blogposts or interviews. I’m most likely to go hunting for a book if I’ve enjoyed the writer’s company in another piece of prose. I’ll check their reviews too, obviously. If I read a really thoughtful review, I’ll often want to know more about the reviewer – especially if they have a book of their own. This means, therefore, that I’m a lot more influenced by gut feeling about the writer’s curiosities, thought processes and delivery. I’ll follow a good voice into any genre. I don’t read fantasy but I love Jack Vance. I don’t read crime but I love Barbara Vine and Dorothy L Sayers. I’m wary of horror, but I’ve been joyously sucked into the latest by Josh Malerman (who is coming up next week on The Undercover Soundtrack … that’s another place where I find glorious reads). In short, I seek the quality that categories can’t measure. And this possibly means that if you’re a writer whose distinctive strength is nuance, your best marketing tool is an interview, a personal essay or a well-turned review. Anyway, this isn’t a post that provides theses or theories, it’s a post of open-ended enquiry. Not a ‘how-to’; more of a ‘how-we’. What are the last 5 books you bought? Let’s examine our book discovery habits. How did you find the last five books you bought? You don’t have to have read them yet. I want to see how you met them. And I hope you’ll teach me some new shopping tips. An interview: I read this and was bewitched. I ordered this. The Next by Stephanie Gangi. She’s also coming to The Undercover Soundtrack soon. Search by category + friend recommendation: This one’s for research. I was looking for accounts of bereavement and Library Thing did its thing. I haven’t read a Didion before, but she’s a favourite of a friend of mine. The irony in the title made it irresistible. Joan Didion – The Year of Magical Thinking. Lucky find in an Oxfam bookshop: I would never have thought to search for this. But there it was in a display. A sane biography of the teenage idol I’ve never grown out of. Under The Ivy. The Life and Music of Kate Bush by Graeme Thomson. Over to you. Where do you discover most of your books? On line, by browsing in a shop? How did you discover the last 5 books you bought and what were they? Any opinions on FB adverts and bargain book newsletters like Bookbub? Your favourite tip for book shopping? How much time should writers spend blogging and building websites? I’ve had a question from Tina L McWilliams: Besides Twitter, LinkedIn, Facebook etc, a website is obviously essential. But what type? Some writers have simple ones, with their books, an author biography and so forth. Others – you and Joanna Penn included – have ‘education’ sites. Which I love, and return to regularly. (Thanks! Ed) So, could you discuss the importance and the time involved with both? If you’ve got Twitter, Facebook, G+, you’re certainly making good connections. But you’re fitting a limited format with little room to customise. You need a place to invite folks to when they want to know more. Also, you control your website’s destiny. 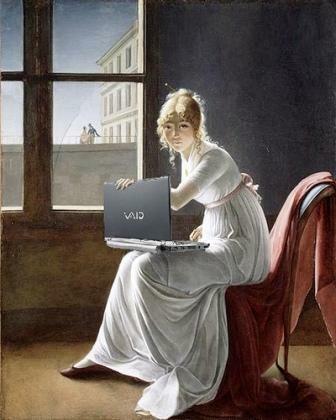 A social medium might disappear – or your crowd might (MySpace, anyone?). But your site is yours. How extensive does the site have to be? If the site’s raison d’etre is to tell people who you are, you don’t need more than a few static pages – about you, your books, contact details. Perhaps a page of upcoming events if you do a lot of these (I don’t so I use social media for this). And voila: a website. If you add a blog, you get noticed more. Search engines favour sites that are frequently updated. Human visitors like to see they’re on the blog of a person who regularly shows up, and notices when new folks call. There are a lot of dead, forgotten sites out there, so you need to make your site look alive. Should you blog about writing and publishing? Honestly? The ether is choked with sites about writing and publishing. Here’s a reason not to: being distinctive If you write straightforward posts about ‘show not tell’ you might find it hard to be noticed – and that’s one of our goals, right? So your posts need to be individual. A lot of writers blog about their lessons and mishaps on their writing journey, so you might find it hard to reach further than immediate friends. Here’s a reason to: getting your material shared If the content is useful or strikes a chord, it’s more likely to be shared. Certainly a lot of people want to learn about writing and publishing. And you might win fans for your gloriously whacky voice (like Chuck Wendig). Who do you want your content shared with? 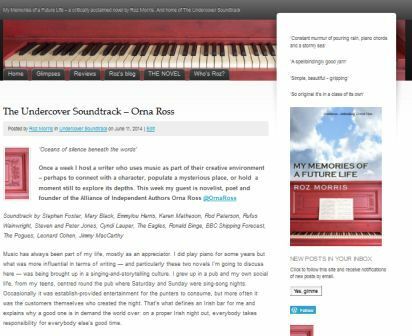 host other authors (like Jane Davis), campaign for better recognition for indie authors (like Paul Sean Grieve), start a blog series like David Abrams on The Quivering Pen with My First Time or me with The Undercover Soundtrack. I still haven’t sussed this myself. Partly this is because my kind of fiction doesn’t suggest bloggable ‘topics’. One book might deal with, say, musicians, reincarnation and despair (My Memories of a Future Life). Another might feature repressive regimes and ruined country houses (Lifeform Three). Even so, those aren’t really my ‘subjects’. I can write the odd guest post about them, but not regular blogs. Ever Rest and my embryonic ideas are different again. My signature, if I have one, is thematic: ideas of the soul and memory, conditions of haunting. I have only realised this as I roam about in Novel 3. I could blog about those themes, but it might discharge my need to explore them in the books. So subject and issues blogging isn’t going to work for me. But it might be good for you. Your blog needs to look current. So make blogging a regular appointment. Include a calendar so visitors can see the pattern. A list of previous or popular posts will tempt them to stay longer. The longer people stay on your site, the better. As often as you find manageable. Experts say that for SEO significance it should be several times a week, but that might exhaust most of us. And think of it from the reader’s perspective. How much time do you have to read blogs, even the ones you love? Once a week is probably plenty to keep you on the radar. Which brings me to… what I do and how much time I spend. Why do I have so many sites? It was an accident, but it seems to work. Each site has a distinct purpose, and they’re all connected to one hub and to each other. This one you’re reading is my original site. More here about how it started, where you can also see charming screenshots of how my blogs looked in 2011 (eek!). Post frequency: I put up a writing/publishing post once a week plus a trailer for The Undercover Soundtrack. Plus signposts if I’ve got a guest spot or devilishly exciting news like a launch. Overall, at least 2 posts a week. Post frequency: twice a week. One trailer to introduce my guest, written by me. One Soundtrack post. Although I don’t write these, they take time behind the scenes. I book guests well in advance (as you’ll know if you’ve featured!). When posts come in, I read them, write back with praise (of course!) and quite often ask for tweaks if I think this would make them fit the format better. Time taken: about 2 hours per week, depending on resubmissions. 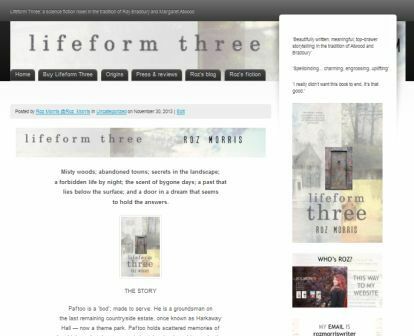 How it started: I’d built a blog for writers, but it wasn’t designed for introducing my fiction. When I launched my novel, I worked out a separate profile-building strategy and wrote this post full of bold plans. I reread it just now and added updates for what lasted and what proved daft or impossible to sustain. Mostly the latter. You might find it amusing. I got this by accident. 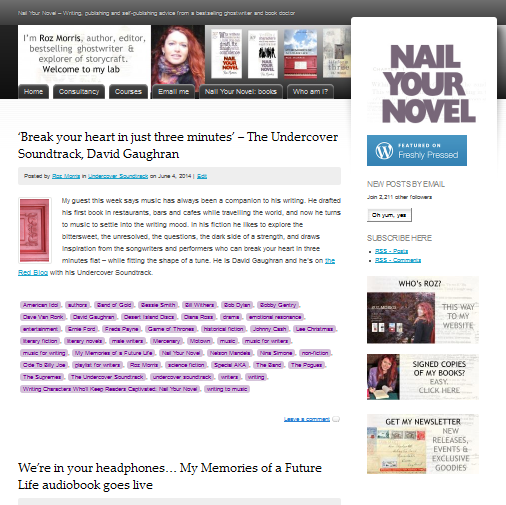 I broke the original Nail Your Novel site, so tried WordPress hosting. I found I’d been given a blog called RozMorris, which sat idle before I realised it even existed. Then I decided to use it as a hub for the others. Time taken: a few hours to set up introductory pages. I’ve added other material gradually as I write it for other purposes – perhaps 20-30 minutes at a time. Updating when a new book launches I set aside a few hours to add a new page, update pics and the main header, then all the versions of it on my newsletter head, FB page, blog head and sidebar, G+, Twitter biography… I’ve got a master list in my production schedule so I don’t miss anything. This is a separate site with its own URL, knitted into the others. Time taken: like the main a uthor site above. I did warn you. If I was starting now, I’d have one blog and one author site for everything else. But The Undercover Soundtrack became its own entity, and I couldn’t graft Lifeform Three on without breaking it. I also couldn’t leave Lifeform Three as a poor cousin with no presence of its own. So my web-web is like a house that’s been extended and extended as times change and the family grows. I don’t doubt it looks messy to purists, and especially when explained here. I’m anticipating comments of horror. 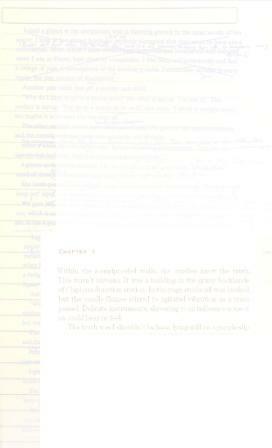 However, I don’t think readers mind if the navigation is clear. I doubt they notice the different URLs. But they would certainly baulk if they had to learn a different visual grammar each time. Even though the artwork on each site is different, it follows the same core design so they find what they want quickly. And yes, apologies. This post is a tad late. Because sometimes life gets in the way of blogging. NEWS I’m thrilled to announce I’m teaching a Guardian Masterclass in advanced self-editing techniques for fiction writers. Of course, London might not be a manageable distance for you, but if it is, here’s where to find out more. And … psst … it’s one of the many good things that have happened because once upon a time, I started a blog. Do you have a blog, a website or both? How much time do you spend on them? Do you want to suggest a way for me to streamline mine? Tell me in the comments!